Though we group them all under the heading ‘winter greens’- chard, kale and cabbage need very different treatment in the kitchen. All three are hardy crops, standing proud through winter frosts and supplying valuable vitamins in a hungry season. One of the best ways of cooking these greens is by braising – use a small amount of liquid, such as wine or stock, and cook slowly to get a tender texture. Cabbage and chard are perfect for stir-frying, giving a crunchy and vibrant result. Here are two of our favourite recipes for allotment winter greens. Chard is kind of unglamorous. It wilts and darkens during cooking, and it’s usually put into rustic supper recipes. 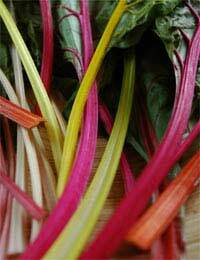 But this recipe gives chard a party makeover! Mediterranean cuisines have many imaginative recipes featuring winter greens, from winter bruschetta to kale torta (a blended soufflé type dish) and spanakopita. Claudia Roden featured spinach puffs in her book ‘Arabesque’, and we’ve adapted the recipe to make canapés. These little puffs can be frozen, uncooked, and then baked for five extra minutes. The result: a chic party nibble made from chard! Who would have thought it? Preheat the oven to 180 degrees C. Chop the chard leaves roughly and put into a saucepan; cover, and leave on a low heat until the leaves have wilted. Drain into a sieve, pressing to remove excess moisture. Turn the chard onto a chopping board and chop it finely; transfer to a bowl. In the saucepan, toast the pine nuts until they are golden. Tip them onto the chard, then warm the olive oil and sauté the onion until it is sweet and translucent. Add this to the chard, along with the lemon juice and seasoning, and mix to combine. Roll out the pastry on a floured board and cut small (8-10cm) circles. Put 1/2tsp of filling on the centre of each one, brush the edges with egg, and pinch to seal. Put the grated parmesan into a bowl and the beaten egg into another. Use a brush to coat the top of each puff in egg and press it into the parmesan to coat. Arrange the puffs on a baking tray and cook for about 20-25 minutes. Boil the potato slices for 5 minutes or until they’re just tender. Drain in a colander. Meanwhile, put the onion and garlic into a deep pan and set over the lowest heat. Let them soften for at least 20 minutes, allowing them to sweeten but not change colour. After 20-30 minutes, add the kale and ½ cup of vegetable stock. Cover and braise the kale for 15 minutes; test to make sure it’s perfectly tender. It may need another few minutes. When it’s cooked, raise the heat and drive off the excess stock. In a frying pan, warm a splash of olive oil over a medium heat. Put in the potato slices to cover the bottom of the pan. Now tip the kale over the top and smooth it evenly. Finally pour over the beaten eggs and season. Cook gently for 10 minutes, then finish under a hot grill (with cheese sprinkled over if liked).